Community Forests International (CFI) is hosting a crowd-sourced architectural design competition for the backwoods cabin of the future. Bringing together visionary architects, artists, green builders and DIYers, the competition is CFI's first step towards establishing a Rural Innovation Campus at its 235 hectare farm and forest outside of Sussex, New Brunswick. This Maritime-based campus will compliment CFI's parallel efforts overseas, where the organization has already begun constructing an equivalent institution on the island of Pemba, Tanzania. CFI will pair the two campuses closely, facilitating an international exchange of ideas and energy in our collaborative fight against climate change. But first things first - how is CFI to accommodate students, innovators and guests at it's nascent Maritime campus in a way that best reflects the organization's goals and vision? At CFI we often look to the land for inspiration, and to natural systems for design solutions. Can our campus buildings blur the lines between humans and nature? CFI has opted to put this challenging design question to the greater conservation and sustainability community, through a wide-open public architecture competition. Anyone can apply - students, professionals, dreamers, and DIYers alike. Entrants will have their design ideas displayed online and submissions will be judged by a panel of leading architects, artists, and builders. The winning designer will receive a $1,000 cash prize, and will see their vision become reality when CFI constructs the building at its Rural Innovation Campus in the summer of 2014. "I think building a backwoods cabin is something we all dream about at some point in our lives. With this competition we're asking people to tap into those dreams and envision how we can get back to nature in the modern world - it's the sort of restorative action that we can all get excited about. " CFI plans to bring people into the forest, to live, learn and innovate, and as part of our mission we want to demonstrate how humans can dwell in the world without destroying life sustaining ecosystems. More than that, we want to push the envelope and discover how our buildings can be designed to have a positive impact on the landscapes we live in. CFI is asking designers, architects, builders and DIYers to help us design a shelter for the future - a shelter that blurs the lines between humans and nature. The Nomadic Cabin entry meets all of the competition requirements in spades. It is compact, easily constructed from local material, is easily movable, and is beautiful. The designers have also been very subtle and sophisticated in the key design move they have made - liek the trailers jacks to support the cabin. 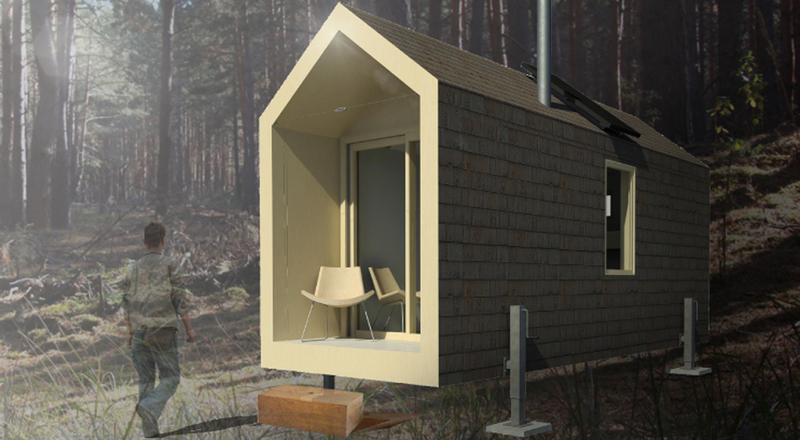 I have a sense that this design will become a popular approach for building rural cabins in the future, and could become an iconic feature of the Acadian Forest landscape. - Craig Applegath, Architect, PPOAA, AAA, Architect AIBC, NSAA, FRAIC, LEED AP. The Hearth entry is one of the most compellingly poetic and inspired entries submitted. It has a powerful, grounded shape, and a materiality that connects it to the forest in a most arresting manner. But it is the inspired idea of having the entire exterior of the cabin clad on horizontal wood planks for storing firewood that gives this form its subtle and somewhat subversive appeal. On the one hand this is a very practical design; on the other, it is a slightly surreal idea - one that would more likely be found in a deepest forest-air induced dream than in reality. - Craig Applegath, Architect, PPOAA, AAA, Architect AIBC, NSAA, FRAIC, LEED AP. The Marlice entry is a very elegant cabin. The designers paid particular attention to both it's constructability and cost. It has an elegant form and would fit in quite nicely in the landscape. It's interior layout is also well thought out and will be comfortable for its inhabitants. - Craig Applegath, Architect, PPOAA, AAA, Architect AIBC, NSAA, FRAIC, LEED AP.